As you may have seen in my post back in January on the wallpaper collection of Florence Broadhurst, Kate Spade has launched a collection of clothing and accessories in New York which utilise the flamboyant wallpaper and fabric print designs of Florence Broadhurst. Creative Director of the Australian Company Signature Prints, Helen Lennie, recently went to New York to work on this collaboration and came back with a whole new colour influence for the Broadhurst range. Based on the brownstones of Brooklyn the range encompasses the colour of the stones, which teamed together with the Broadhurst prints make a beautiful collection. Known for traditionally for their bold colours, this new palette certainly brings a more subtle and sophisticated look to the prints, and are certainly easy to think of a few spaces in your home to place them. Possibly the most spectacular coastline in Victoria has to be the Shipwreck Coast, just less than a couple of hours out of Melbourne and you are there. The Great Ocean Road, which follows a long path along this coastline brings in to view some of the most famed and spectacular rock formations such as the 12 Apostles. It is also home to broad sandy surf beaches such as the famed Bells Beach, with wide, sweeping bays skirted by rocky ledges formed from the lava of prehistoric volcanoes. When the sun is shining the coast gives off calm peaceful feel, it is hard to imagine how it could have turned so violent toward ships in years gone by. We are, however, assured that the winter months bring incredible powerful storms to make the Southern Oceans ever changing temperament so much more believable. Partnered by wind, rain, and a few years of time, the sea carves the cliff-faces and offshore rock stacks, forming amazing stone structures that include the Twelve Apostles and Island Arch. But as carefully as they create these structures they eventually destroy their own handiwork, as the undercut limestone and sandstone tumbles into rubble, or disappears forever under the rolling waves, reducing the actual count of these huge offshore rock stacks to only eight. The rocks and caves of the coast are home to seals, penguins, bats and a host of bird life. The Shipwreck Coast is a destination that will leave you with lasting memories whether it be the start or end of your journey along the winding road. Basis for the palette…. Taking the calming natural greens of the hinterland and mixing them up with the stormy blues of the ocean and sandy red tones of the rugged rock formations that stand boldly along the coast line. A little bit more information on The Ship Wreck Coast……. There are lots of spots to stop along the Shipwreck coast. Whether you opt to stay or just pop in for a visit you should find something to suit, although it is always to book up well in advance and be prepared that during peak seasons much of the accommodation has a minimum of two or three night stays so it may be good to find a couple of mid points from which you can explore the other regions. This also means that you are not spending the whole trip jumping from one hotel/B&B to the other. Point of View – Apollo Bay – Although the drive up the hill is a little bit hairy, the accommodation is well worth it, with an amazing view that extends over the bay from every room. The accommodation is family run and has everything you need (including a bottle of bubbles on arrival!). It is a great central stopping point between Melbourne and Port Fairy and allows you to easily access all of the major must see spots. Lorne – The buzzing pretty little town of Lorne has plenty for all, from quirky street statues to relaxing beaches. There is plenty of accommodation but if you are just passing it is a great place to stop off for a quick bite to eat and a wonder. Cape Otway – It is worth a trip to the most southern point of the great Ocean Road to see the Cape Otway Lighthouse. One of many built in response to the rough southern sees which bought many a ship to her knees. And if your thinking “not another light house”….. as believe me there are a few, this trip is worth it for the fact that the approach road is littered with Koala’s sleeping in the trees. Just keep your eyes peeled, or watch for everyone else pulling into the side of the road for a photo opportunity….. but do beware we all know too much eucalyptus makes for a “drop bear”!!! Great Otway National Park – If you are yearning for a bit of rainforest and a good bit of brisk walking then the Great Otway National Park is perfect. The Otways are home to the longest and tallest elevated walkway in the world, and if you have a few hours to spare and are seeking a thrill they also have the zip line so you can do a bit of a Tarzan impression if so inclined. The Twelve Apostles – Driving the Great Ocean Road and missing out the Twelve Apostles is like going to Paris and ignoring the Eiffel Tower. They are the seas very own unique sculptures. As nature continues to eat away at many of them there are only 8 still fully standing in their glory, so each time you go it may be a different view you see. The Grotto – The low viewing area allows you to see the fine mist from the wave. On a sunny day this can result in forming beautiful rainbows. Flagstaff Hill – If you want to understand a bit of the history of the shipwreck coast and understand a little of what it was like to live in these formative years The Flagstaff Hill Maritime village is a fun place to stop. They also have a multi million dollar light show in the evenings to tell the story of one of the disasters. Lorne – River Tea House – For a list of teas of all shapes and colours and possibly THE best carrot cake I have ever tasted you cannot miss a stop at the River Tea House in Lorne. Appollo Bay – Chris’s Restaurant – For a great view, a little bit of a Greek influenced gourmet treat and an obligatory glass of Ouzo! You cannot go past this restaurant. Once again it is a drive into the tree tops of Apollo bay but with every table having a view it is hard to beat. 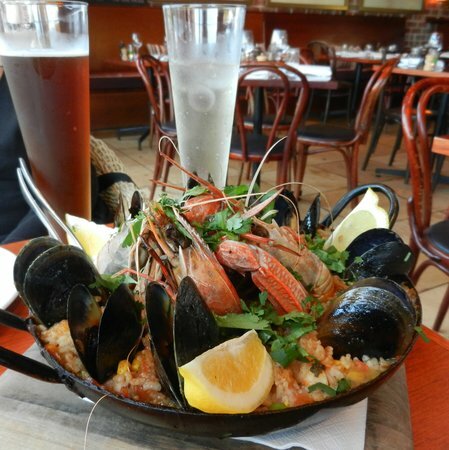 La Bimba Apollo Bay– For something a little less formal, for those with a love of seafood you cannot walk past La Bimba …Once again if you are lucky you will find that elusive Cray fish! Whether this is your last stop as you cross from Victoria to South Australia, or whether this is your first landing point as you travel in the other direction, you cannot miss Port Fairy out on your itinerary. With whaling long a truly gone as an industry provider of Port Fairy, it still celebrates the seas and fresh seafood that surrounds it, with many a decent restaurant to choose from. You can laze along the Moyne river and watch the sail boats gently rocking in the breeze whilst you enjoy a glass of wine or two, take a walk to the Griffith Lighthouse and spot a kangeroo or three, or relax on the beach – a little something for everyone. If you were to choose one place to stay this would be it, within short reach of the remaining 12 Apostles, the Grampians and the Coonawarra wine region it is a good mid point to stay. So with colour in mind I used this as inspiration to put together a palette of colours and special finishes which could be translated into the home. Basis for the palette…. focusing on the seas, and historical town, and local blue stone I have put together a palette which is subtle, calming and natural but picks up a bit of fun from the folk festivals that it prides itself on. A little bit more information on Port Fairy……. With tourism being the main source of income for Port Fairy accommodation is wide and varied, from caravan parks to boutique hotels. Oscars Boutique Hotel – For a little bit of luxury and a pretty good hearty breakfast as part of your tarif, Oscars Boutique Hotel does not disappoint. Even better is the fresh rich shortbread for you to nibble, dunk or scoff with your afternoon cuppa, as you watch the world go by from the private verandah. With it’s Georgian style and french chic furniture it eludes grace and grandeur without the pomp and circumstance. Griffiths Island– For a bracing but easy stroll or bike ride, with a mixture of sea life and terra firma wild life, you can take the walk around Griffiths Island. The lighthouse stands at the eastern tip, surrounded by the ruins of the lighthouse keepers cottages. The Stag Inn – is a good place to start, with its use of seasonal local produce and relaxing setting. A little posh, but good to spoil yourself. You also cannot go past without taking in the aroma of the fresh rosemary bushes that surround it’s entrance. The Merrijig Inn – the former Stag chef’s have moved to this little spot, overlooking the Moyne River. Wisharts on the Wharf – For something a little less formal, for those with a love of seafood you cannot walk past Wisharts at The Wharf. Not exactly fine dining, but hailed as some of the best seafood in town. Especially if you are after that elusive Cray fish! In preparation for 2012, Murobond Paints (a boutique paint company based in North Sydney) put forward a magic box of inspiration for us to use to come up with a palette of colours for 2012. We were required to use this inspiration to produce and collage, from which we were to derive a palette of twelve colours. The palette needed to have a name and a story……and here is my submission. “As a child I would take a little box and fill it with “treasure”. Pebbles, shells, buttons, feathers, flowers and seeds. Perhaps worthless in value, but priceless in the innocent fun I had collecting. I would imagine that the buttons were jewels, the feathers….. well perhaps a quill used by nobility, or themselves an object holding the stories of many a continent that it’s owner had flown to. What to do with my treasure? Do I bury it for future pirates to find, and mark the spot with an “X” of twigs. Do I decorate a mudpie to serve up to the fairies at the bottom of the garden? The possibilities are endless…. Back to the feathers my attention turns to the bird singing in the tree, maybe this feather belongs to him… He seems not to care as he turns his attention to creating a home out of carefully selected twigs and leaves, whilst softening the nest with bedding of moss and downy feathers plucked from his chest. He is surveying the view from his new home glowing from the reflection of the golden Marigolds beneath him. Perhaps he is in search for something a little special to make his families feathered nest….. just that little bit more special.